Do you struggle to understand the complicated world of music theory? Does it frustrate you trying `get` what chords work with one another? Do you watch other guitarists run up and down the fretboard and wonder why you can`t do that without playing wrong notes? Every single guitarist has at some point struggled to understand what on earth is going on when it comes to the world of music theory. …written by renowned author and music teacher, Dan Thorpe is here to help you simplify the complex world of music theory once and for all. Learning music theory CAN be complicated and it can be boring but it doesn`t have to be! 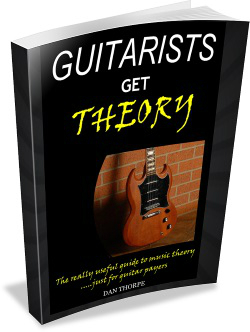 Do not worry – `Guitarists Get Theory` has the answer taught in a fun, light-hearted and simple to follow guide..
Want to learn other peoples` songs quicker than ever? These chord progressions will help you to skyrocket your own songwriting ability and help you understand those of your favourite artists and learn them quicker. One of the most frustrating things for most guitarists is that they either know zero theory or worse they know bits and pieces and can`t put it all together. This leads to confusion and frustration. One of the aims of this book is for me to clear up ALL that confusion and teach you the things you need to know, the things that will make guitar playing easier in a straightforward and easy to follow guide. The multiple reviews I have featured below from Amazon highlight that I did a good job doing so. Learning the notes on the fretboard is something most guitarists want to be able to do but find it very, very hard. That is due to it being poorly taught. Two very important points to remember is that on a guitar (just like all instruments) is that: · There are only 12 different notes but some of these notes are repeated at the SAME pitch. Eg. 12th fret 6th string and 7th fret 5th string. It is little nuggets of information like this that most people are never taught. I simplify it all and break it down for you to understand in a clear and simple way. PLUS – Understand and use the Relative Major and minor key`, Consonance and Dissonance, harmony and which notes work with which chords so you can write awesome guitar leads and vocal melodies. 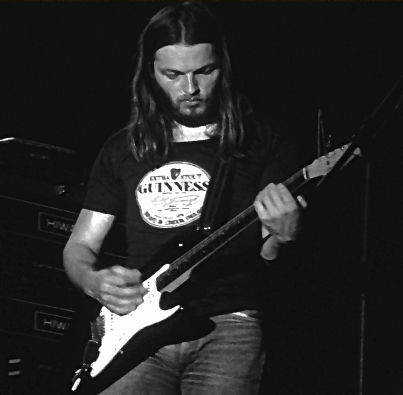 “I’ve been searching around on the net for some decent music theory related to the guitar. This book is one of the best things I’ve read on the subject. It manages to teach theory in a really practical way for guitarists. I found the bit about chord progressions useful for my songwriting, and the patterns for learning the notes on the fretboard makes a lot of sense too”. 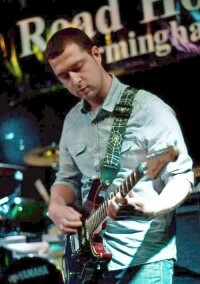 “I have been playing the guitar for years, but theory has always eluded me as a self-taught player. This book, in the span of an hour, has taught me more than I’ve learned in the last decade. So simple, but so clear and easy to get. I can’t wait to read it again and begin to finally grasp the guitar, instead of fumbling around for hours waiting for “my ear” to find the right notes. This is a must-read for anyone beginning the guitar. Learn this now and save yourself the pain, for experienced players, take the time to look this over if you have questions about theory. It also explains the “Nashville” style of session playing that uses Roman numerals for chord progressions, something I always struggled with. Spend the few bucks, it’s better than a year or lessons”. A great book that simplifies guitar music theory for beginners. Just what I was looking for. Guitar theory is very tedious but the writer helps you through with shuttle humour. Explained very well and in laymen’s terms. 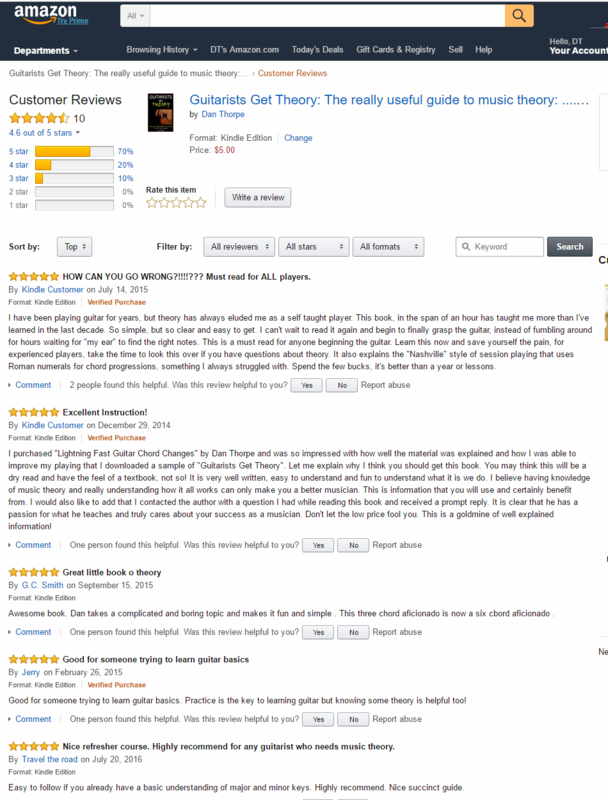 Buy Guitarists Get Theory and if you are in any way dissatisfied once you have read the book, I will refund all of your money, immediately, no questions asked. 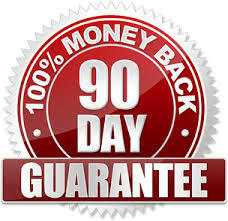 I have no problem offering this kind of guarantee. Why? The techniques I use to teach guitar work repeatedly for countless students of my own either in direct one to one lessons, group lessons or the students who have studied my eBooks. I know these techniques work. They’ll work for you too. 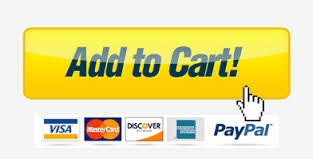 If you buy Guitarists Get Theory directly from me, and not from Amazon, you`ll be paying the same price BUT if you buy from me, you`ll get an exclusive bonus too. This cheat sheet pack contains the `Key of G Major Cheat Sheet` (which ties in wonderfully with some of the core information within the book). This also comes in both colour and a black printable version as well as your very own blank version. The blank version is a very useful tool too. It is there so you can fill out other important key information which will help cement the valuable information in the book so it stays with you for the rest of your guitar playing life. Guitarists Get Theory costs just $4.99 and comes in both PDF and Mobi versions which means you can read it on your Kindle or device.